I am pleased to announce that we are up and running with my project ‘6 North’ (which is our working title). My first blog post for 2015 is complete. Blogging has been time-consuming but I am now on track again! While on this page please do check my blog posts regarding details of all sorts including my final 2 fundraisers before our travels and a video of interview with students and parent. My above video was made to attract crowd funding funds but now that crowd funding is over. My latest video interviewing students and one parent answering my question “What Australia means to you?” as well as many others can be viewed on this site, in my video section. As well as being an enthusiastic cook I am also a Homestay mother to international high school and university students because I believe they need my support while they adapt to Australia. Everyday I experience with them the same topics I wrote about in my book ‘My Recipe for Cultural Interchange’ which was published over a year ago. While you are there consider reading excerpts from the book. I am an experienced traveler and have been busy writing about my adventures but now I am ready to film my next adventure for you and turn it into a travel and food documentary for TV. The subject will be about life as it is experienced by Homestay students and their parents; their anxieties, their hopes, their joys, the food and cultural differences they experience and much more. I feel passionate about food because quite simply that is what keeps us alive so why not enjoy it? I am also keen on everyday topics because I believe that they have a long-lasting effect on our lives. These days when most people are asked ‘How are you?’ their reply is often ‘Busy’. I have always been busy but now I am busier than ever. Seriously, I know now and understand fully the level of a really busy life. Some of you may know where I am coming from. The next few months are going to be even busier for me working on this project. It has been an idea that I first thought of five years ago and I have been steadily working towards it since September last year. I am wondering if you can offer me some support in helping me achieve it. You can support me straight away by donating through paypal by clicking the button below. You don’t need to currently have a paypal account, as you can create one in the process – click here for some quick help. You can then use your paypal account for other secure online transactions. You see, while I was researching, documenting and finally composing my book I always had the idea of turning it into a film documentary (doco) because I believe film will bring to life the words I have written. Sometimes written words just aren’t enough to convey emotion. Many of my past students are now adults and some have their own children. This shows how long I have been a hosting students. My idea is to visit them in their own home; in China, Japan, Vietnam, Thailand, Singapore and Malaysia to see how they are doing now and how they have succeeded since their studies here. I want to experience their own culture and food, their family and their environment just like they did when they were in my home. I want to ask them if they benefited from their studies and if they will send their own children to Australia too. Most importantly I want to observe their culture and food, from breakfast and lunch to dinner. In the West we are so familiar with cereals and toast for breakfast and sandwiches for lunch and a cooked meal for dinner. My doco will film these differences. When I return I shall put together a video in which I will cook my own twist on what would be a normal type of 3 meals from each of the countries journey that students when here will enjoy. I left Malaysia when I was 21 and I have lived in the West for 35 years. Last September I was invited to my nephew’s wedding. It had been ten years since I had last visited KL and back then I relied on my family to take me around. How time flies and things change. After my nephew’s wedding my husband and I visited parts of Malaysia as tourists and started recording for research on my documentary on a shoestring budget. With a handy-cam we visited and filmed local markets, tasted the food, filmed the cooking methods, were invited by people into their homes, got to cook for others as usual and attended other functions. There we interviewed a local who had been a Homestay student in the U.K. for seven years. What he had to say became a very interesting unrehearsed on-site interview. Many things he said echoed passages from my book. It became clear that no matter where you go abroad to study there will always be differences that need to be understood. I am dedicated not only to my students and their parents and the education system here, but also to the public. 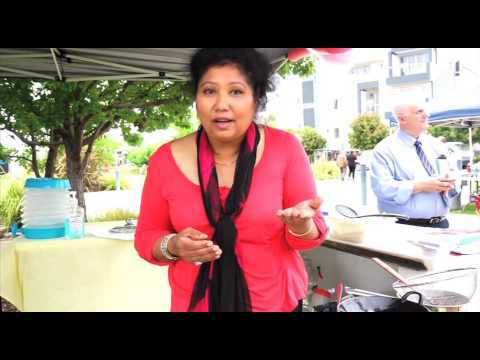 You will see me fundraising each week for my doco by selling my sauces at my local street markets. I display, sell and demonstrate my own brand of ‘signature sauces’ OGG (onion ginger garlic), Peanut-free-satay and Hot Sambal Relish which I created for public taste-testing as for market research for future franchising. In the meantime sales from these Sunday Markets fund my documentary. We still need much support to raise money for camera equipment and editing so please do share my mission and goal with your circle of friends and family so that together we can make this happen, thank you. In the meantime I welcome your feedback and support. One thing you can do is send me your comments and suggestions and, if you’d like me to develop a special recipe for you in return for a small donation then I shall oblige. My 60 day recipe challenge made for my crowd funding is now complete, I did all that I said I would do. They will now go offline so that I can section them into mini cook books into vegan/vegetarian, chicken, meat, seafood, entree, soups and dessert categories. If you’d like any of these before they go for publishing then send me an email. The backgrounds of my past Homestay students mean there will be six countries I need to visit during this time and I envisage each country’s journey will become one episode of 24 minutes forming a six part series. This will involve many weeks of traveling and filming which will then be edited on return to Australia over several months. I will also cook on camera from my own kitchen to produce these episodes either for viewers online, or to pitch to TV channels. I wonder if you can help me now by raising money for my doco, even if you are not in Australia. Those of you who are local then do come over to buy my sauces at my regular Lightsview and Parafield market stalls. Either way, I will bring my doco to you somehow. I believe my travel documentary will help people to understand different food and cultures. They can see how other people live their daily life. This can help us all to understand each other better and your help will make this happen. The great thing about the Net is that you could be anywhere in the world and still be able to help this project get a good start. You may also subscribe to my website, I will update you as my project progresses via my blog pages displaying my fundraising events or simply via my Facebook pages; Simply Sarj Kitchen/Cooking or my Facebook group page; ‘My Recipe for Cultural Interchange’. So, please subscribe below, like and share these pages and events. Thank you! My recipe pages will still have many recipes for you to download and produce for your own pleasure and I shall leave it up to you to donate towards my project. For larger donations I will personally buy and sign a copy of my book for you so just send me an email message requesting a copy. I can also raise funds by cooking for your dinner parties and negotiating a cost per person. We welcome Corporate sponsors at Gold, Silver and Bronze level. I believe that with your help and support we can together achieve something interesting and worthwhile. It is a topic I have not yet seen documented by others, so let’s be the first to do it! After over 17 years of experience as a Homestay Mother I have much to share with you and others. The International student industry recorded in Australia in 2009 was over $18 bn (reference: http://archive.coag.gov.au/reports/docs/aus_international_students_strategy.pdf) So, Homestay students and their parents have much to share with all of us. My food and culture doco journey could secure Australia’s future as the best host-nation in the world for international students. Remember, it is food that warms their heart. My doco could well be history in the making and you will play a role in its creation by donating! Just as I am sharing my passion with you in the written word, in return you too can share this with the person next to you and together we can make this happen. I have a vision and a goal that together we can achieve more! Sunday 28th December 2014 saw us gather together to have a sausage sizzle launch and the next one was organised on Monday 26th January 2015 on Australia Day public holiday! The final two local fundraisers before we embark on this journey will be on public holiday Monday 9th March during the day and then on Saturday 21st March in the evening. Those attending will have a personal update on my project and about how much has been raised so far towards this journey. Please be active via my website by vising my blog page for all the latest on locally held fundraisers and for my local market appearances. Please subscribe below, to hear more about events like these. I remain busy till mid this year with the filming of my documentary and with various fundraiser and market stalls. I shall also be busy looking after our university and high school visitors from Japan, China and Indonesia. I feel the desire to keep on learning about the culture and environment that our students bring to our home. I have learnt that when you think you know a lot about the experience of being a Homestay parent there is always something new to learn. I can only present this documentary with informed knowledge by experiencing it like I am. Modern technology has created easier communication between host families and student’s own parents so a journey for both parties is now bridging the gaps that was so wide during early days of my hosting. Today I am using technology to make something special happen, and yet I only started using that technology not so long ago. Some students come here with confidence to learn comfortably in an environment that is new to them, but others struggle with the differences. There may be reasons for this that I can also document. I feel that we Homestay parents give our time and care for the benefit of these students just like we would to our own teenagers but often it may not be appreciated due to our lack of interest and understanding how they normally live. Many Homestay students try to do the right thing but some don’t for various reasons that may remain unknown. The ones who make an effort can become like surrogate children of your own, but the ones who don’t make an effort remain strangers. No two teenagers are exactly alike, that’s part and parcel of life. When we do get a student who makes an effort to adapt and vise versa it can be a very rewarding experience. Most of my teenage students have shown interest in following my simple way of cooking and have cheerfully offered to give me their feedback on their own experiments too. Culturally and food-wise we are quite different but eating together and a shared interest in food can bring people much closer and this is what my journey of ‘6 NORTH’ can explain. How odd can some people’s tastes be e.g. ‘Miso soup’ for breakfast would be an unusual flavour for a Western breakfast! On the other hand our breakfast of cereal and toast daily could be equally odd for them back in their country so let’s document 6 cultures’ daily routines. If these topics interest you and you wish to know more then you are already on this journey with me! My doco shall also record experiences from my perspective and as well as from others’. Interaction during meals will show how important mealtimes are in other countries. Have we lost some of this basic connection in the West and among our young? Come and travel with me from the comfort of your homes, to experience and understand other cultures and their foods and their interaction with each other during mealtime. My years of Homestay-parenting has shown me a lot and given me many memories, some good, some not so good. I described many of them in my book, things like: “food warms the heart” and “when in Rome do as the Romans do”. These adages are well-founded – but how well are they applied in different cultural settings? Many Homestay parents make great effort to welcome visiting students to make them feel at home in our country which is so different to theirs, and yet, this may not be enough if their food culture is not understood. I hope that some of these stories resonate with you in some way, especially about the Homestay environment when it comes to food. Please feel free to write a comment or donate as much as you can by clicking the links provided. Together, we can truly create something new in the world that improves our ability as humans to understand one-another better and, if this can be done, then food may just be that link. Before many International Homestay students arrive in Australia they are under the impression that we are just an English-speaking country. They soon realise that our society is much more diverse and that we are a multicultural society because people from all around the world live here. Students discover how many different cultures, religions, languages and types of food make up the rich tapestry of our mixed community and most students quickly change their viewpoint after a few days here. They make new friends from other countries and experience different types of food and develop fond memories with their new friends as they come to value their differences. They maintain those international friendships through the Net even though they may never get the chance to meet again in person. How much did their experiences in Australia change them and how different did they feel when they returned to their home countries? Japan/Kansia(Osaka & Kyoto City), Busan/South Korea, China (Shanghai & Shijiazhuang City/Herbei Province), Vietnam (Ho Chi Min City), Malaysia (Kuala Lumpur/Penang), Singapore. The purpose of my journey would be to experience the cultures of these countries via my students, especially filming of their food of a typical breakfast, lunch and dinner over Western cereal & toast, sandwiches and one daily cooked meals as well as learning their etiquette, understanding their cultural values etc. My filming may include; a forum party that invites others, students who have already studied in Australia and those who are planning to come to Australia for the first time. I invite you to attend these forum parties to interact with me and each other and be part of my recorded interviews both here and overseas. I would love to meet with parents, agents and educator providers to come and join in our conversations to help give this documentary further depth. Show your interest via an email to sarj@simplysarj.com.au. Thank you. “Now that you have returned to your home country how many of our Australian values have you taken and kept with you’? I will also welcome and invite questions from anyone concerned i.e. parents, grandparents to ask me ‘the Homestay Host mother’ about any matters regarding their loved ones (students) who are now studying in a foreign country in the West, especially Australia regarding food and living. Enjoy the translated version of my questions in other languages by clicking the preferred list above. Trước khi nhiều sinh viên quốc tế đến Homestay tại Úc họ có cảm tưởng rằng chúng tôi chỉ là một quốc gia nói tiếng Anh. Họ nhanh chóng nhận ra rằng xã hội của chúng tôi là đa dạng hơn nhiều và chúng ta là một xã hội đa văn hóa bởi vì mọi người từ khắp nơi trên thế giới sống ở đây. Giao lưu, kết bạn từ các nước khác nhau và trải nghiệm nhiều loại văn hóa ẩm thực giúp sinh viên trân trọng những nét khác biệt của họ.. Họ duy trì những tình bạn quốc tế thông qua mạng xã hội mặc dù họ có thể không có cơ hội gặp trực tiếp ở ngoài. Những kinh nghiệm sống ở Úc đã thay đổi suy nghĩ của du học sinh dù học như thế nào và họ cảm thấy thế nào khi họ quay trở về quê hương của họ? 1.Bạn thấy sống chung với tôi hay với người bản xứ ở adelaide hay những nơi khác như thế nào? 2.Bây giờ bạn đã trở về nước và bạn mang theo trong người những điều gì từ nền văn hóa của người Úc? 3.Bạn có thể chia sẻ với tôi cuộc sống hằng ngày của bạn như thế nào không? 4.Bạn có thể dạy tôi cách nấu ăn ưa thích của bạn không? Tôi cũng chào đón những câu hỏi từ gia đình, cha mẹ hoặc ông bà của các du học sinh với tư cách là một người từng du học có kinh nghiệm 16 năm. Tất cả câu hỏi liên quan đến con cái của họ đang sống và học tập tại Adelaide, nước Úc. Sebelum siswa-siswi Homestay internasional tiba di Australia, mereka berpikir bahwa negara ini hanyalah negara ber-bahasa Inggris. Tetapi mereka segera menyadari bahwa masyarakat kami sangatlah beragam dan merupakan masyarakat yang multikultur karena orang dari berbagai negara tinggal disini. Para siswa juga segera menyadari ada banyak budaya, agama, bahasa, dan makanan yang membentuk keindahan permaidani keberagaman mayarakat kami. Hal-hal ini merubah pandangan para siswa setelah beberapa hari di Australia. Mereka berteman dengan orang dari berbagai negara dan mencicipi makanan-makanan baru. Mereka mengalami hal-hal menarik ketika berbaur dengan budaya yang berbeda-beda. Mereka menjalin dan menjaga persahabatan antar bangsa melalui internet walaupun mereka mungkin tidak akan bertemu lagi. Seberapa besar pengalaman mereka di Australia sudah merubah mereka. Adakah perasan berbeda yang mereka rasakan ketika pulang ke negara masing-masing? Negara-negara yang akan saya kunjungi; Jepang, Vietnam, Cina, Malaysia, Singapura, Thailand. Tujuan perjalanan saya adalah untuk merasakan budaya dari negara-negara yang saya kunjungi melalui para siswa, termasuk mecoba hidangan mereka, belajar sopan santun di negara tersebut, memahami nilai-nilai budaya disana, dan sebagainya. Selama kunjungan saya, saya ingin mengadakan pesta forum dan mengundang orang-orang, seperti para siswa yang pernah belajar di Australia, yang sedang pulang liburan di negara mereka, dan yang berencana mengunjungi Australia pertama kalinya. Saya ingin mengundang Anda untuk hadir di pesta forum ini dan berinteraksi dengan saya dan tamu lainnya dan juga untuk menjadi bagian dari wawancara yang akan saya rekam. Saya juga sangat ingin mengundang orang tua, agen, dan institusi penyelenggara pendidikan untuk hadir dan bergabung dalam acara ini. Penyelengaraan acara ini akan diorganisir dengan bantuan para siswa homestay yang berasal dari negara tersebut. Informasi secara rinci akan diberikan kepada pihak-pihak yang tertarik untuk menjadi bagian dokumenter saya. Jika Anda tertarik, silakan menghubungi saya melalui sarj@simplysarj.com.au. Terima kasih atas kerjasamanya. Saya juga membuka kesempatan kepada orang tua dan kakek dan nenek dari para siswa untuk bertanya tentang pengalaman saya sebagai orang tua asuh di program Homestay selama 16 tahun. Mereka bias menanyakan semua hal tentang anak-anak mereka yang sedang belajar di negara barat, khususnya di Adelaide, Australia. Adalah menjadi perkara lumrah bagi seseorang pelajar antarabangsa yang tiba di Australia untuk program Homestay mengganggap bahawa Australia adalah sebuah negara barat yang hanya menggunaka Bahasa Inggeris sebagai Bahasa utama . Tetapi yang menariknya, mereka akan segera menyedari masyarakat Australia terdiri daripada masyarkat majmuk terdiri daripada berbiling kaum yang terdiri dari masyarakat berbilang kaum kerana masyarakat Australia sendiri mempunyai latar belakang dan salah silang keluarga dari pelusuk dunia. Pelajar dapat mengenali pelbagai jenis budaya, agama , bahasa dan berbagai jenis makanan hasil dengan hanya bergaul bersama masyarakat majmuk Australia dan kebanyakan pelajar. Apa yang menariknya, pelajar-pelajer segera akan mempunyai pandangan yang berbeza apabila melihat sisi yang berlainan Australia dan masyarakat Australia. Secara tidak langsung, Australia adalah Negara yang menyambungkan hubungan silaturaahim sesama masyarakat Australia dengan mengenali lebih ramai kawan yang berasal dari seluruh pelusuk negara. Kenangan manis dan hubugan persahabatan yang berkekalan dapat dicipta hanya melalui pelbagai hidangan makanan anatarabangsa dari negara-negara lain. Sifat hormat-menghormati antara satu sama lain adalah kunci utama yang mengeratkan persahabatan yang dibina. Mereka meneruskan persahabatan antarabangsa melalui internet walaupun mereka mungkin tidak pernah mendapat peluang untuk bertemu lagi di masa hadapan. Berapa lamakah pengalaman mereka di Australia menukar mereka dan apakah perbezaan yang mereka alami apabila mereka kembali ke negara asal? Negara-negara ingin saya lawati ; Jepun , Vietnam , China , Malaysia , Singapura , Thailand . Tujuan lawatan saya adalah untuk memahami budaya negara-negara ini melalui pelajar-pelajar saya , termasuk mencuba makanan mereka , pembelajaran etika mereka , memahami nilai-nilai budaya mereka dan lain-lain. Dalam lawatan saya ke rumah pelajar, saya juga ingin meyertai forum yang menjemput orang lain, terutamanya pelajar-pelajar yang telah belajar di Australia , ditambah mereka yang pulang bercuti semasa lawatan saya , dan mereka yang merancang untuk datang ke Australia untuk kali pertama . Saya menjemput anda untuk menghadiri majlis-majlis atau forum untuk berinteraksi dengan saya atau antara satu sama lain dan menjadi sebahagian daripada rakaman wawancara saya . Saya ingin berjumpa dengan ibu bapa , ejen dan pembekal pendidik untuk datang dan menyertai perbualan kami yang akan dianjurkan dengan bantuan perjalanan pelajar Homestay tempatan saya . Maklumat lanjut akan disediakan untuk mereka yang berminat untuk menjadi sebahagian daripada dokumentari saya , jika anda berminat, sila hubungi saya melalui e-mel kepada sarj@simplysarj.com.au. Terima kasih . ” Sekarang anda telah pulang ke negara asal anda berapa banyak nilai-nilai Australia yang telah anda mengambil dan disimpan’ ? Saya juga akan mengundang soalan daripada ibu bapa , datuk nenek untuk bertanya kepada saya sebagai ‘ ibu kepada pelajar Homestay ‘ dengan pengalaman selama 16 tahun , apa-apa perkara mengenai anak-anak mereka yang sedang belajar di sebuah negara Barat khususnya Adelaide , Australia . Bahasa Malay translation by; Hasniza Hilmi. In order to produce this documentary, I need your help. Please consider donating by clicking the button below. Thank you! If you are interested in this project, and would like to be informed of future news; please type your name and email below. Nice to see that things are moving along for you. Congratulations! I look forward to learning more of your progress. I spoke to you and your husband today at Parafield Market and heard how Stephen met you one day, went on a date the second day and got engaged soon after. I hope you remember who I am. I’ve read you about your documentary and seen your students comments about Australia, all really interesting to read. I hope you can let me know when your documentary will be shown on TV and what channel. It was a pleasure to talk to you and your husband today. I am sorry that I did not get back to you after our meeting last year (how time flies so fast). You may not remember me, but we had an impromptu interview at my Hot & Roll kiosk in Central Market. Your husband (I am sorry I forgot his name) was reluctant to put his vidcam on without my permission. Anyway, nice meeting you. Hope to see you soon and shares so many tips and tricks living abroad and still able to have Malaysia delicacies! Haha yes, how time flies and indeed we remember you. Please check your email for the booking of your interview time. Cheers! Hi all, our filming journey of 6 NORTH was successful and we returned during last week of April with many footage of interest to work with for editing. 🙂 Bear with me as I sort my webpage, blog and recipes etc but, in the meantime head along to my blog site for the latest on my completed journey. http://www.simplysarj.com.au/2015/05/filming-of-6-north/ There will be new up date added on my blog site weekly. Enjoy!